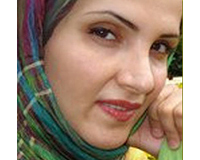 Hengameh Shahidi has been in detention for 2 years, just because she spoke her mind. Hengameh is an Iranian journalist and human rights activist. She was arrested in June 2009 following demonstrations in Iran around the contested presidential election. She admitted to participating in the protests as a journalist, and thus was sentences to six years in prison. Hengameh was not “gathering and colluding with intent to harm state security” or creating “propaganda against the system.” She was exercising her innate right to free speech and her right as a journalist to spread the truth. Her actions do not justify her sentence. Filed Under: FEATURED EVENTS, MIDDLE EAST, WORLD EVENTS Tagged With: A Celebration of Women, care2, Free Journalist Hangameh Shahidi‏, freedom, freedom of speech, government control, Hengameh Shahidi, HUMAN RIGHTS, human rights activist, Iran, journalists, propaganda, propaganda against the system, system, Take Action, women journalists, women taking action, women's rights, women.